Yeh i know the post titles don't get any better...but i have a Ripley's story that is hard to believe. This infatuation with research also aids my decision making process in the model room & layout building...although the research definitely takes up the time that could be spent on the layout...hmmm an enjoyable conundrum. When i first started frequenting Goulburn well before i moved here, one of the dominant features of the trackside infrastructure & the skyline was the old flour mill. This mill & associated site has a history to be believed & has been a cornerstone of my research for the last few years. I guess i should begin by "siting" the mill to put this story into perspective. The mill is situated immediately adjacent to the up main around 400 metres north of Goulburn Station on the up side of the main running lines, just beyond the Blackshaw Rd Level Crossing. The rear of the plant faces the railway while the front faces Sloane St. The site originally was home to a fully enclosed public swimming baths that boasted gas lighting & a smokers room in the tower that was built & opened in 1892 & was designed by Goulburn architect E.C. Manfred who was also responsible for designing a fair few local landmark buildings. 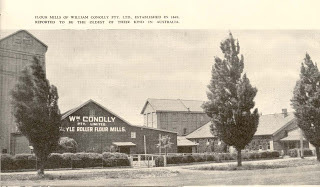 The baths & site were sold in 1906 to William Connolly who already operated the Argyle Flour Mills elsewhere in Goulburn. He set about building a modern flourmill which incorporated the baths building in the finished mill. The actual pool was just covered over with floorboards & the building put to work. At the time, the mill was one of the largest & most modern equipped mills in the country area of NSW. The Peerless brand of flour it produced was reputedly world renown for quality & was exported to a fair few overseas countries. The mill survived into the early 1970s when closure took effect & in the late 70s the site was sold to a local family who after making some significant changes & additions to some buildings, installed a 14 lane Ten Pin Bowling Alley & the old public baths area was converted into a roller skating rink... Yes the mill was now a leisure centre!!! Another transformation of the mill took place in latter years where the bowling alley was dismantled & removed & the whole building including the pool area was reopened by the same family as a retail furniture business. The furniture business relocated to new premises at the beginning of 2011 & as i write this post the whole site is laying empty & for sale. While the main buildings are heritage listed it will be interesting to see what becomes of the site & associated buildings as it looks for another chapter in it's already incredibly diverse life. For those who are interested... Yes the pool still exists under the floorboards of the building that housed it. I have been priveleged to have stuck my head underneath the boards & witness this remarkable feature....still very much intact. So... where else would a public baths have been transformed into an integral part of a flour mill...then the whole site play it's part as a leisure centre & later be the home of a furniture store??? The main mill building is obvious while the building at right housed the original public baths & later a roller skating rink. The signwritten shed & the elevator / silo complex were demolished to make way for the new addition that housed the bowling alley & carpark. The entrance to the original public baths is at far left adjacent to the tower which once contained the " smokers room"
The bowling alley was housed in the long building extending from centre to right of shot. Visible on the roof of the main mill building is the support structure for the now removed water tank...While not visible in the previous shot it was added & removed in the intervening years. I was very interested in your post as I have researched and excavated the flour mill at Yass. Something interesting that emerged is that the mill actually imported wheat from the central west to mix with the local variety in the flour. The NSWGR required bulk loading facilities for this traffic in the 1950s and that caused the Crago family to close the mill. I mentioned this only because of wheat going in by rail was an unexpected traffic as the local produced wheat for the mills came by road. IIRC, the mill was shunted by the goods shed road Shunting engine, as it was used for the goods shed & several other sidings on the up side of the line, usually by one of the 32cl allocated to Glbn. Any wagons that were for Northern areas or detached at Glbn off up trains were attached/detached in South or Wheat yard opposite Loco, by this engine during the course of the day, from both the goods yards & North yard. From memory of working in & out of Glbn in the 60's I rarelly saw the mill without wagons in there in daylight hours. Its one of those iconic type of buildings that are part of the history of Goulburn & good to see it will be preserved with the heritage listing.